It's great when a company refuses to rest on its laurels, when it insists on pushing boundaries. For instance, Mattel is always finding new and exciting ways to completely f^(# things up. Some say Death is a grim reaper or a dark angel. 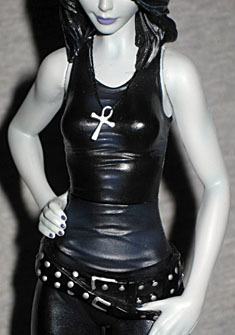 But Neil Gaiman's famous interpretation of Death, the Sandman's older sister is pretty, perky and always gets the job done. She's been around since the beginning of time and is exactly the kind of girl you'll want to follow into the unknown. The '90s gave the world two memorable new representations of Death: the Vertigo version, and this. And just think, only one of them is a complete joke today! Death of the Endless was the breakout character of Sandman, but because Gaiman actually knows how to craft a story, she appeared only sparingly through the rest of the series. He could have bowed to public pressure (aka, given fans what they wanted) and turned the focus increasingly onto Death, and today we'd all be as sick of her as we are of Deadpool or Gambit. So if you still like her today, write Neil Gaiman and thank him for his restraint. Let's get this out of the way right up front: this is not an action figure. We've long maintained that at minimum, in order to be an "action" figure, a toy needs to move at the shoulders, hips and neck (yes, that would discount a lot of figures, but it's a guideline - moving on). Death moves only at the Springfield Four, so no, this isn't an action figure. She's got a very cute pose, with one hand resting on her hip and the other thumb hooked into her belt, but it's the only pose she'll ever be in. Her right elbow is permanently bent at a 90° angle, and her hands are at angles to her arms. Okay, there are a few alternate poses you can get: there's the "you're going downtown," the "let's hear that snap," and the "did I put on deodorant this morning?" Wow, what an amazing variety! Back around the time of the SDCC announcements, we asked the Four Horsemen if they'd designed this figure - and no, they didn't. They'd discussed doing a Death exclusive in the past, but Mattel didn't even approach them about this one. What the heck, Mattel? We may be reading too much into this, but the structure of the face looks like a Barbie design. It may not be by the 4H, but the sculpt is still good. 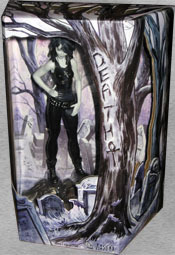 Death is wearing a tight tank top and stretch pants, two overlapping studded belts, and heavy combat boots that are tied lightly. Her silver ankh necklace hangs from a real string around her neck. 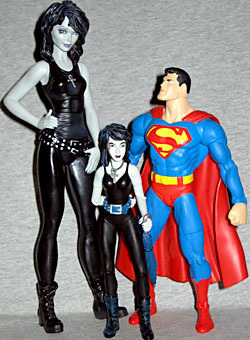 Her skin, rather than being true white, is a pale gray - the same thing Mattel did for their Lobo. Her clothes are black, of course, but there are silver apps on her belts and boots, and a dark blue airbrushing on her shirt to fake depth and lighting. She appears to be wearing metallic eyeshadow, and her irises and lips are purple. There's a little bit of blue in her hair to create highlights and keep the sculpted hair from looking flat. The absolute first rule of an action figure is that it needs to be able to stand on its own. Like we said, if you've designed something that can't stand up unless it's on a display base, then you need to go back and redesign it. Death might have been able to stand, if she had some kind of articulation in her legs and you could thus fine-tune her pose, but no, the way she's made, she'll never remain upright without help (the picture at the top of this review notwithstanding). The base they've given us is admittedly pretty cool: it's a large, ornate skull that's half-sunken into the ground; but rather than just sitting on the surface flat, the way you or I would probably design such a thing, it's on an angle, so the right eyesocket is lower than the left. It adds a little bit of visual flair to what would otherwise be a very staid presentation. 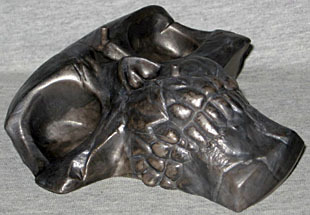 The figure is sold in a large box with a complex window on the front, sides and top. The artwork, by Jill Thompson, shows everybody's favorite perky goth just hanging out in a ramshackle graveyard, which doesn't really seem her style: as she once said, "I have about as much to do with skulls as your average chicken has to do with souffles." Basically, she doesn't care about the bodies, just the people who lived in them. That said, it's a nicely moody piece, done not so much in grayscale as a duotone of gray and lavender, and the window that allows us to see the figure is broken up by the bare branches of a tall tree. The tray that holds the figure is more of the same, and she's posed in the package the same way she'll pose in your display. When this figure was announced, we all hoped that the description of her as an 8" figure was wrong, that it also included her base or something. No such luck. She stands 8½" tall, which makes her too big for your other DC figures, and too small for the Barbies that influenced her, and in exactly the wrong scale for any and every other collectible you own. Maybe she's meant to fit in with Lobo, Swamp Thing and the oversized movie Batman Mattel is going to be selling soon - you know, all the figures they've done that were the wrong size. Of course, it's not like the character has an actual physical form (other than the one day a century when she spends 24 hours as a mortal), so who's to say what's right or wrong? Still, if you want a Death to fit with your DC figures, track down the DC Direct version from 1999 - she's not much by modern standards, but she's better than this. Between Death and Batman, Mattel is two for two on DC con exclusives this year.